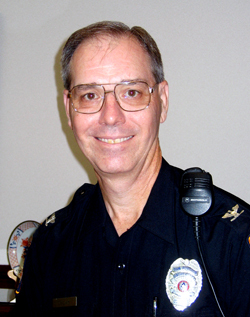 Dennis Culak, a long-haired student when he walked into Sam Houston State University police chief Charlie Tackett's office and asked for a job 31 years ago, is SHSU's new director of public safety services. Culak, 53, took over for Tackett this week. Tackett, who has worked in Texas law enforcement for 55 years, has been named chief emeritus and will officially retire Oct. 31. "He told me, 'go get your hair cut and come back and we'll talk,'" Culak said Friday. He did, admitting that long hair is no longer a problem. He said the department will continue to operate as it has with few if any changes. "I learned from the master," said Culak. A native of Spring Branch, Culak earned his bachelor's and master's degrees from SHSU in 1973 and 1975 in law enforcement and police science. His advance to the top position in the department has included service as police intern, student assistant, police officer, sergeant, 1st lieutenant, captain, commander, and colonel. "Serving in this capacity has been my goal for many years," said Culak. "I'm extremely grateful that the university has bestowed upon me their confidence." Culak and his wife, Paula, have two sons--Tony, a teacher in the Huntsville public school system, and Adam, an SHSU senior criminal justice major. Jack Parker, vice president for finance and operations, which includes the office of public safety services, said that Culak was an obvious choice for the promotion. "He embodies all the attributes that are good about our nation," said Parker. "Honesty, responsibility, and ability to build relationships. He will be a tremendous chief." Parker said that a retirement event is being planned for Tackett in October.